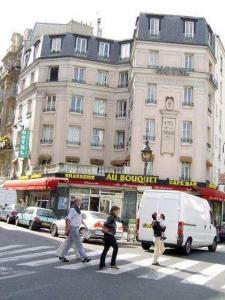 Hotel De La Terrasse, Paris discount hotels and accommodation. Ideally located at the entrance of the flea market (the largest antique dealer market), 5 min away from the Sacré-Coeur, not far from the City of Sciences and from the main tourist sights and business districts. L’Hotel de la Terrasse offers a warm atmosphere, all the rooms are equipped with shower, direct telephone, Satellite TV.Highway A1 exit 5 min away, direct access from metro station Gare du Nord, Gare de l'Est, Montparnasse Railway station..
View photos, room descriptions and make online reservations at Hotel De La Terrasse. Save on room prices at Hotel De La Terrasse, Paris.